Earlier this week I watched an elderly Palestinian woman walk down the corridor on the second floor of Augusta Victoria Hospital. Her traditional embroidered dress suggested that she was likely from an outlying village of the West Bank, a Muslim, perhaps accompanying a grand-child hospital patient. She bore all the signs of a long and hard life, raising children, engaged in agriculture, a witness to generations of conflict. She had difficulty walking, but seemed to be on a mission as she slowly and with difficulty began descending the staircase. Then the sound of footsteps on the hard stone steps stopped. Was everything all right? I hurried over to the stairwell to check. There she was standing on the landing, taking photographs of the lighted artificial Christmas tree that greets visitors during this special time of the year. Not the greatest tree by American standards, but a tree that brings joy to those the many who pass by each day. 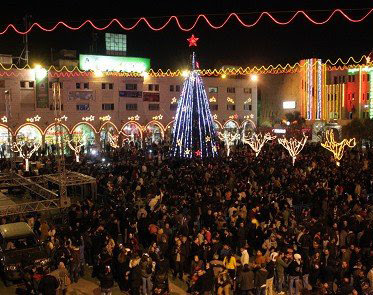 Last night in Bethlehem, thousands (both Christians and Muslims) gathered in Manger Square for the annual Christmas tree lighting ceremony. Dignataries made speeches and all spoke of unity, peace, and good will. Next week begins Hannukah, the eight-day Jewish festival of lights, a celebration of religious freedom. So this week the Jerusalem municipality has been busy erecting Menorah on light posts leading west from the old city. A large Menorah will soon be erected at Jaffa gate as last year. The Mamilla Mall near Jaffa Gate is lit up for the occasion. With sunset in Jerusalem now at 4:30 p.m. lights are warming, revealing, and hopefully attracting. It’s clearly a time for us all to stand back in admiration of the gifts of religious diversity—all the more striking when similar symbols cross over from one tradition to another—as do the lights of the season. On Tuesday, we joined with Swedish friends for Santa Lucia day. 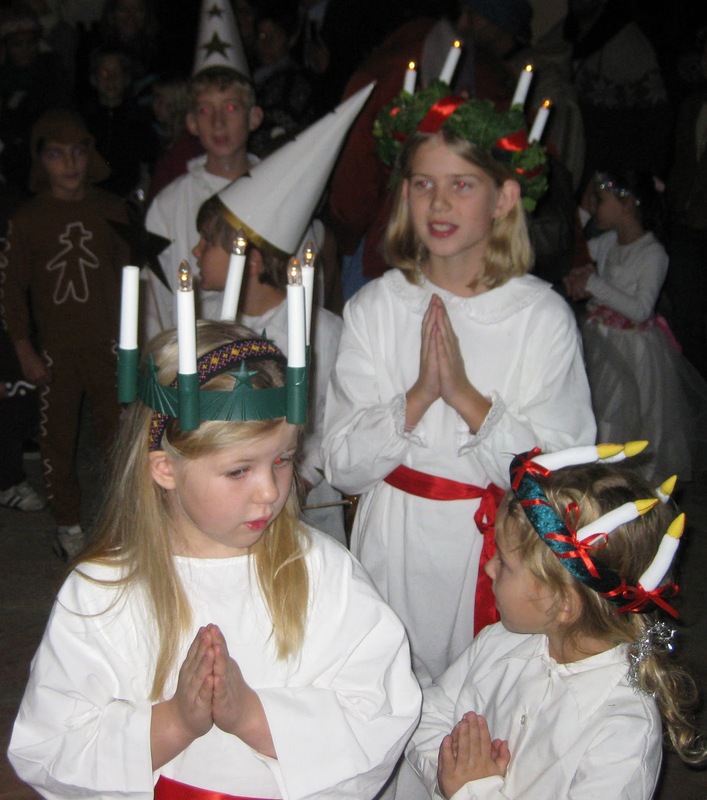 With young white-robed girls donning candle wreaths on their heads, and younger children dressed up as gingerbread kids, a proud kipa-wearing father photographed his daughter’s participation in the choir. Such images can only give hope for a better tomorrow. And then there’s the story of my Muslim physical therapist, who with her husband and teenaged daughters drove to Bethlehem just to look at the lights and Christmas decorations. 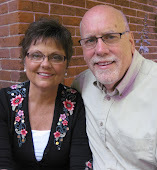 This weekend they plan to go to her Christian neighbor’s home to help her decorate her tree because this widow’s only son is studying abroad and she would otherwise be alone. Christmas trees are not common here like in densely forested areas of northern Europe and North American. We are on the edge of the desert. In fact, is illegal for a person to cut down trees without government permission, even on one’s own property. The Jerusalem municipality does offer a service for churches in providing a few trees when thinning out is necessary. We’re thankful for enough greenery to make an Advent wreath. As for artificial trees and decorations, they are just not on the market in Israel--not even at Ikea, as a shopping trip this week revealed. Just red and white candes. Now in Bethlehem and Nazareth, that’s another story. Christmas is big business. Sunday night in Nazareth the Latin Patriarch led the community in its annual tree lighting ceremony. This year the ceremony held a special significance in overcoming the darkness of intolerance and religious bigotry--in this case that of the Mayor and city council of Nazareth Illit who last Christmas announced that Christmas trees would be banned from that neighboring city. Nazareth (210,000 population) is the largest Arab metropolitan area in Israel proper, made up primarily of the city of Nazareth (67 % Muslim, 33 % Christian). In 1954, Nazareth Illit (upper Nazareth) was built as a Jewish neighboring city or suburb although today 9 % of residents are Muslim and Christian. 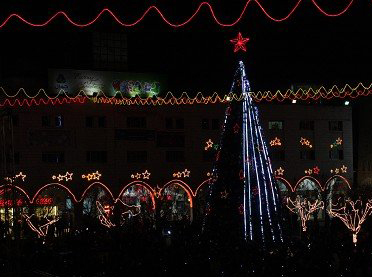 "The request of the Arabs to put Christmas trees in the squares in the Arab quarter of Nazareth Illit is provocative," Mayor Shimon Gapso was quoted in newspapers. "Nazareth Illit is a Jewish city and it will not happen -- not this year and not next year, so long as I am a mayor." It was a Muslim member of the city council, Shukri Aawdeh, who defended the Christians, "Decorating a tree is just to share the happiness and cheer with other people in the town." In reading stories like this, we are reminded of the intolerance exhibited by some in Christian-dominated communities of Europe and the States toward religious minorities. The mayor's blindness is a grinchlike quality that often crosses boundaries into actions that are totally unacceptable. 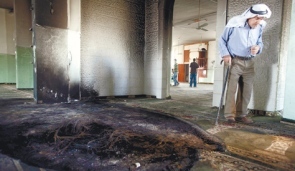 Yesterday morning, when the West Bank Muslim villagers of al-Burqa near Ramallah arrived to say morning prayers, they discovered their mosque had been set on fire under the cover of darkness, burning carpets and furniture. 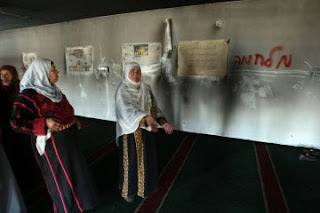 Women at al-Nour mosque in village of Burqa observing the Hebrew spray-painted graffiti. The previous morning another mosque had been set on fire in Jerusalem, this time a historic mosque dating back to the 13th century. The graffiti included statements like "Death to the Arabs" and "Muhammad is a pig." 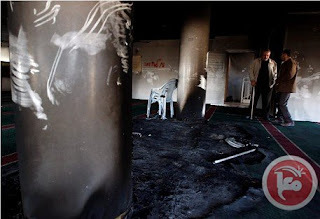 Just a week ago a third mosque was set on fire at Bruqin near Nablus and several others over the last several months, in an escalation of settler violence with destruction of olive groves and Palestinian property in the West Bank. Inspecting the damage of mosque fire at Tuba-Zangaria this summer. All of these attacks have one thing in common, the word "Price tag," a signature by Jewish settlers (many American immigrants) illegally occupying West Bank Palestinian land. They have put the Israeli government on notice that any attempt to limit their actions and their expansion will be met with violence toward Palestinians whom they wish cleansed from the land. This flare-up of violence follows reports published this week in Haaretz newspaper that settler crimes in the West Bank against Palestinians over the past five years have rarely been punished and that IDF soldiers now claim settler violence against Palestinians far exceeds Palestinian violence against settlers. As evidenced by Haaretz Op-Ed pieces, many Israelis are embarrassed and are publicly separating themselves from the out-of-control settler problem. Others continue to look the other way. Ehud Barak used the term "terrorism" to describe these actions. 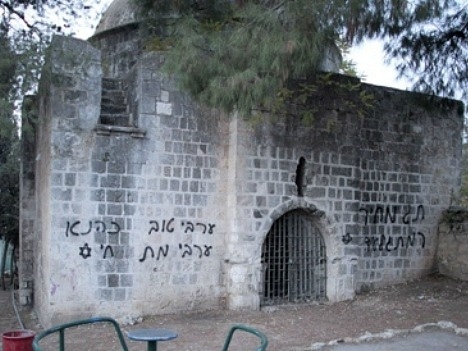 Yet when Prime Minister of Israel Netanyahu, the chief promoter of settler expansion, was asked to issue a strong statement, he noted that this is not terrorism, but more a boys-will-be-boys type of vandalism carried out by "a small group that does not represent the public that lives in Judea and Samaria." And back in Iowa where caucuses are only days away, such stories seldom see the light of day while politicians, press, and pundits continue to pretend and preach, stumbling through an unenlightened mythic realtiy that leads only deeper into the night.